A client recently contacted us to solve their appointment reminder problem. They had to reduce no show appointments. They were manually calling patients, and when it got busy, the calls were not made. No show appointments were out of control. Using the Patient Communications Gateway (www.PCGcare.com) the practice immediately reduced no show appointments to 8%. After the practice deployed the process to all its locations, we improved their system, by a lot. Now the practice makes an automated call, sends an email and finally, a text just before the patient is due in the office. The increased frequency is only part of the solution, customized templates for location, doctor and visit are included in this system. PCG reduced no show appointments to just 4%. Costs are $0.40 per patient. This is an automated system, no additional actions are necessary from practice staff. If the patient does not want the email and text after the call, they can opt out. Further cost savings. What else can a reminder do? PCG reminders just a part of the system built to communicate with patients. When PCG checks the schedule to send out reminders, it can also check on when the patient last updated their demographic record. And of course, send the necessary update form with existing data included. Does the patient have a balance, PCG can see that too, and send a reminder that asks for payment. Practices that wait to remind a patient 48 hours before an appointment have limited options to fill the vacated appointment. Many reminder systems that leave messages cannot capture a response if there is no answer. Typically, patients need to call back the next day. Starting the process a week or more in advance improves the chances of booking another patient. In this case, without having to call patients last minute. The key is having patients that cannot make their appointment notify the practice quickly. Filling a canceled appointment with a new patient is a great win. The impact of isolated, stand-alone reminder providers is several no-shows per day, leading to physician burn out from over scheduling. This over scheduling almost guarantees long lines at check in, limited time with the patient and a practice that suffers from the culture of frustration. The Patient Communications Gateway solves this problem automatically. Based on triggers, once the options are determined, PCG does the rest. Doctor’s visits are just part of a busy patient’s day. With more distractions available than ever before, communicate more than once. The Gateway gives your staff the time to do what they do best, welcome patients to the practice. Reminders are another patient communication opportunity to show you care about your patient’s time and health. 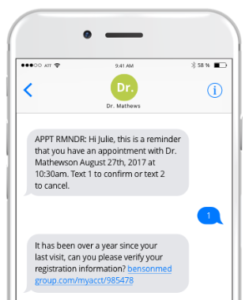 Reduce no show appointments with personalized communications specific to patient needs. Learn more about we can reduce no show appointments.